Conceived on the back of over 70 years combined successful experience in the fields of Exhibitions, Conferences, Roadshows, Retail & Media, opus 3 creative provide award winning creative designs, inspirational environments and unrivalled project management across the globe. 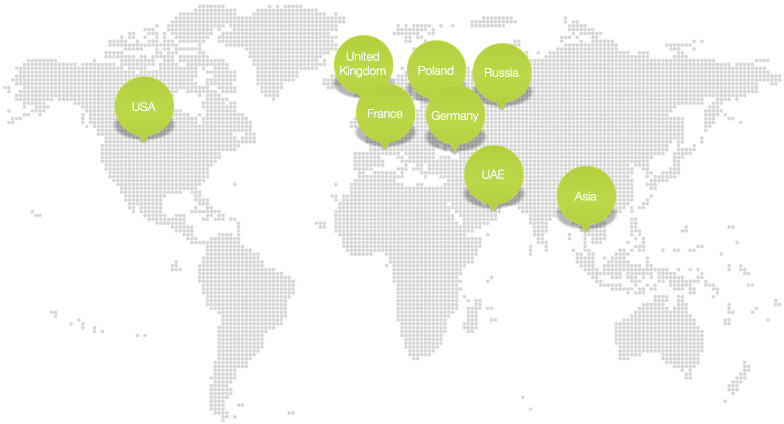 Our offices and production facilities are based in the UK, Cannes, Poland and Dubai. We are also fortunate to have a network of like-minded strategic partners based in Germany, Moscow, Bangkok, Australia and the USA enabling us to take care of and enhance your global event programme at a local level. Simply, delivering brand support beyond your expectations. Natalie joined opus 3 creative in 2016, shortly after graduating with a degree in Media Production. Natalie’s attention to detail and strategic planning have made her an invaluable asset to the team. Ian is one of the co-founders of opus 3 creative and has almost 30 years of industry experience behind him – predominantly in Sales & Marketing. Eddie is one of the founding Directors of opus 3 creative and has a history spanning over 30 years within the exhibition and events industry – specialising in Sales & Project Management. Mark heads up the Creative Design Team, has a background of over 25 years in the exhibition industry and is one of the three founding Directors. Susan heads up the UK & European Sales & Marketing Team and has had a supporting role within the company for 5 years. Liss joined us in 2018 from within the industry after eagerly seeking a job role with more creative licence. She brings a fresh approach and enthusiasm to the creative table and has quickly established herself as one of the key members of the design team. Lloyd has been working with Opus 3 since its creation – both behind the scenes heading up production and at the front end in project management. We built 5 booth upgrades in the Event Serve built pavilion which were a significant contribution in the USAPEEC (USA Poultry & Egg Export Council) winning best stand over 100sqm at Gulfood. The bespoke interiors were designed in the UK and installed by our Dubai team, who were praised by one exhibitor as “world class” and by another as “the right type of customer experience”. We're with Nuance at CCW in Berlin this week - great branding by another of our clients, Genesys! I have been working with them for the last couple of years on all of our tradeshows across Europe. They really have been delivering some amazing results for us and have become one of our most-valued partners. What a good surprise to get back from a break and find ‘that’ box on my desk. I really enjoyed the gift – thank you – but above all it reminded me how good it is to work alongside genuinely decent and good people, like yourselves. You deserve every success you’ve achieved so far and I wish you a 2017 with even more success. All the best in 2017. Opus 3 creative has some key strengths: Attention to detail, professionalism, understanding of needs and wants, providing value adding solutions and creativity. These along with many others including your winning attitude make you, our supplier of choice. I had a good feeling about working with Opus 3 and when I saw the finished stand I could not have been happier. With the ludicrous time constraints the outcome was an outstanding stand and a satisfied customer whose expectations had been surpassed! Opus 3 have been a fantastic collaborator offering the best service and design at very fair prices. Nothing is too much trouble; their attention to detail is exemplary. When the exhibition comes, just turn up and get to work, everything will have been taken care of. On the back of a proven relationship with Opus 3 Creative it was a given we would be working with them at IPEX again. Not only did they ‘come up trumps’ with a new identity, show brochure, ad campaign and on – brand stand design. I wanted to say a formal thank you for all of your work in delivering a hugely successful EWMA booth presence. Your hard work, ideas, knowledge, dedication and delivery are invaluable. As solution oriented professionals, Opus 3 have the savvy to accommodate our increasingly complex technology requirements and they never fail to propose superior design solutions that not only exceed our expectations but enhance the AQRE brand. Any environment, creatively designed, targeted at your specific audience, anywhere on a global scale.